As a boy growing up in the Ether Valleys of Mīran, among his ancient technologically evolved alien race, Glenn Gammeron dreamed of living a life of "big money and big adventure." While reports vary on Gammeron's age, it is safe to assume that he has been actively pursuing such a lifestyle for several hundred years. As a skip tracer, Gammeron has scouted much of known space, across countless worlds, for fun and profit. Gammeron maintains offices in seven solar systems, including one in Los Angeles. No stranger to Earth, Gammeron learned French (and picked up an accent) in Shreveport, LA in the late 18th Century. On Mars, Gammeron made the acquaintance of the hero J'Onn J'Onzz, and knew him in the time before the plague death of most of the population. At some point, Gammeron and J'Onzz worked a case together on the alien world of Xanthcar. Gammeron appears to like and respect J'Onzz, even consoling the Martian over the death of his family. However, the future Martian Manhunter maintained an antagonistic stance toward Gammeron for the nearly two-hundred-eighty-eight years that lapsed between their meetings, and Glenn does not believe J'Onzz ever mentally recovered from his loss. For the respectable sum of 80,000 credits, Gammeron accepted a Xanthcan contract for the apprehension and trial of the intergalactic tyrant Despero. However, at the time, Despero's mind was believed to have been wiped and replaced with the benevolent artificial lifeform L-Ron. 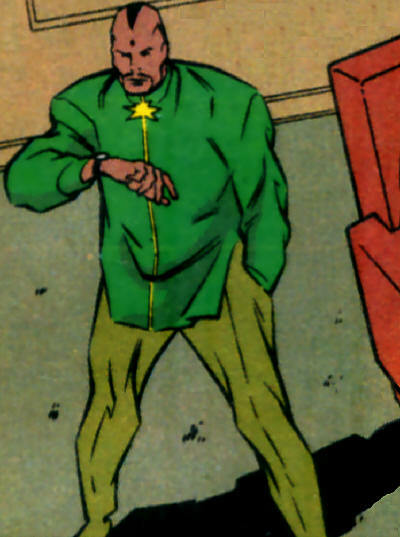 Despero's body resided on Earth, and L-Ron employed it as part of the heroic Justice League Task Force. Regardless, Gammeron managed to subdue the immensely powerful being, although he paid a courtesy call to the JLTF's leader, J'Onn J'Onzz, regarding the matter. While Gammeron wished to be civil, he had no intention of losing his bounty, just as J'Onzz would not allow an innocent teammate to be held captive for Despero's crimes. The disagreement came to blows, but a stalemate was declared when L-Ron announced that he wished to face a jury trial. J'Onn J'Onzz respected L-Ron's wishes, but gathered his team for a trip to Xanthcar to insure justice was served. Gammeron was conflicted while Despero was in his custody. On the one hand, he acknowledged the consciousness of L-Ron, and expressed some small gratitude when his bounty helped protect Glenn in a fight involving terrorists fixated on the trial. On the other hand, Gammeron eagerly brushed aside any moral considerations in the face of hard cash, and went so far as to torture the bound L-Ron/Despero to affirm his dominance when control was threatened. Struggling with the reassertion of Despero's dormant consciousness, L-Ron finally succumbed to the stress surrounding a trial at which only a death sentence would satisfy the masses. L-Ron drew Gammeron into his telepathic domain, then made Glenn believe that he had switched bodies with Despero. L-Ron/Glenn ordered guards to execute Gammeron/Despero, and the real Gammeron was startled from the illusion by his own screams. Finally sympathizing with L-Ron and facing a lynch mob, Gammeron pretended to be knocked unconscious as Despero escaped. However, the mob still held Gammeron accountable, forcing him to join the Justice League Task Force in fleeing Xanthcar in a stolen spaceship. The vessel was less than sound, and the group were left stranded in the lost world of Skartaris, a barbaric land hidden under Earth's North Pole. Gammeron worked with the team until they could return to the surface world, then lingered through the Christmas holiday. 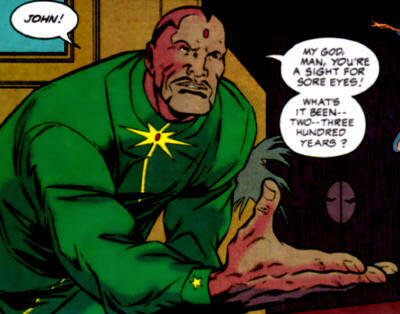 L-Ron, who had been separated from the group since Xanthcar, returned to deliver to Gammeron the 80,000 credits lost when Despero turned fugitive. However, Gammeron's reputation had been sullied, and following a brief flirtation with staying on amidst the JLTF, Glenn was soon off to recover face in the bounty hunting game. Such a case came when a sentient spore skipped bail for Earth, grafting itself onto a human host in Jersey City, NJ. 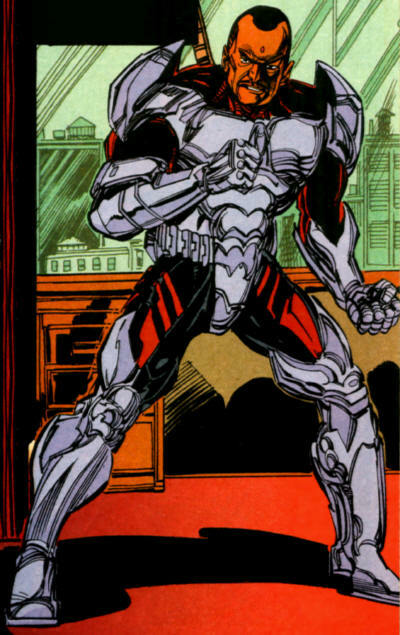 Gammeron enlisted the aid (and a retainer) from Dr. John Henry Irons, also known as the armored hero Steel. After employing an ineffectively scattershot investigative method, both men benefited from the assistance of Dr. Arthur Villain, who struck up a fast friendship (and research deal) with Gammeron. The trio captured the spore, and Gammeron a 125,000 credit bounty, capitalizing Glenn's departure from Earth and return to prominence in his field. Gammeron asked that Steel thank the Martian Manhunter and apologize for half the trouble he had caused. There were no further reports of Gammeron's being active in super-human circles for many years before his sudden arrival on the Justice League Satellite via their teleportation system. 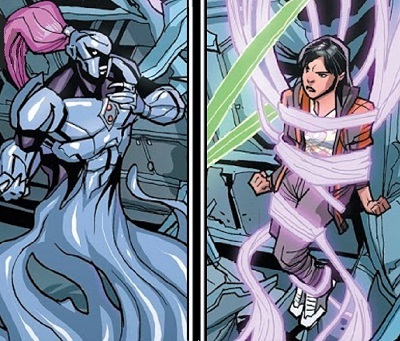 His arrival startled Green Lantern Jessica Cruz, whom he fought to a draw before she ceased hostilities. Gammeron had come seeking the aid of J'Onn J'Onzz, but was informed his old ally had himself been missing for some time. The sentient spore dubbed "Billy" had returned to Earth, and although Gammeron had managed to recapture it and cleanse most of its terrestrial impact, a lone cockroach had escaped. Given its capacity to breed in short order and at an alarming rate a species of roach that could chew through steel, addressing the matter immediately required the power of the collective Justice League. 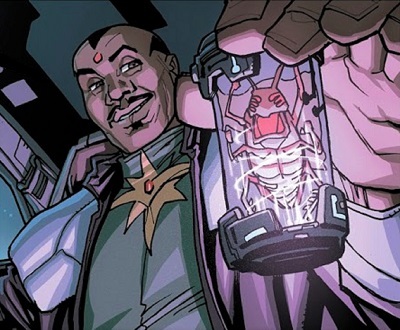 Ultimately, Gammeron encased the gigantic hive form infected roaches in a binding agent while Cyborg's sonic amplifier allowed them to locate the primary host for extraction and extradition. Gammeron wears a suit of highly advanced alien armor which can morph at will across his body in parts or as a whole. He has demonstrated the ability to revert to a liquid metal form, as well as cloak himself in the image of beings that inhabit the various planets on which he pursues bounty. His strength class seems to be near that of a Martian, and he is a skilled hand-to-hand combatant. It is unknown if Gammeron's abilities are derived from his armor or from within himself. While in full armor, Gammeron can breathe underwater. His gauntlet can emit a negative energy flux discharge capable of harming the Manhunter, even and perhaps especially while he's varying his density. Gammeron can project holographic maps of much of the known universe. The armor allows him to fly, provides relative invulnerability, and seems equipped with a universal translator. Regardless, Gammeron is a polylinguist of unknown but likely enormous breadth, given his travels. 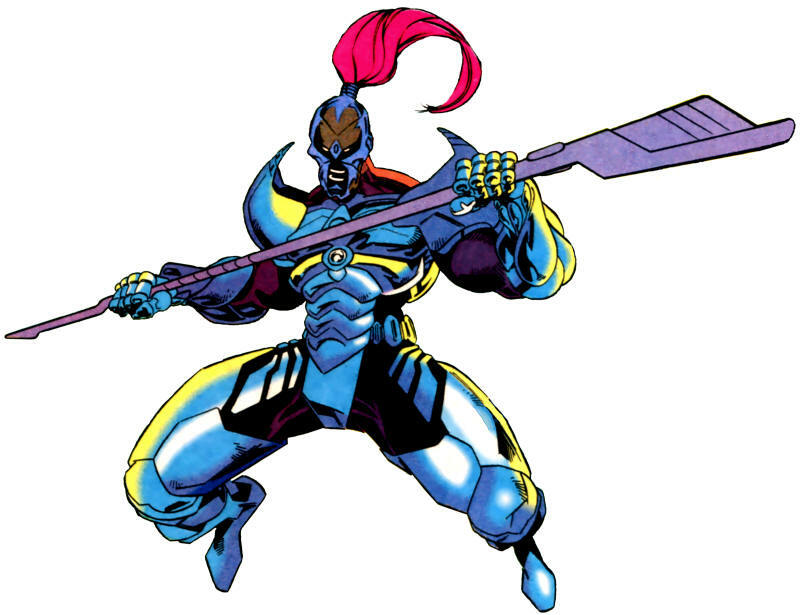 On Earth alone, he has demonstrated fluency in English, French & Spanish.Gammeron's weapon of choice is his battle staff, which can emit devastating energy blasts, as well as a quantum pulse that can depolarize the light waves in Oan power ring constructs. It appears Gammeron can also create his own energy bands of pale mauve hue to ensnare foes, seemingly originating from the staff. He also possesses a gun that sprays a sticky, voluminous substance that can snare an energy being, as demonstrated against the Ray. Gammeron travels in a transforming spaceship that can assume the appearance of a rental truck. While Glenn is an alien, he assumes the appearance of an African-American male in his mid-thirties. He has stated that he chose to model his form after "after a human image of beauty" without gauging "the ignorance of primitive cultures" on Earth beforehand. He bears a red oval gem on his forehead that glows when he activates his armor, and his hair ends in three severe widow's peaks at his temples and brow. Glenn is rarely seen without his cellular phone. He is always in contact with his significant other, Leslie. Glenn Gammeron values money above all else, but is not completely without conscience, and seeks the respect of others. Gammeron is tenacious, and not above playing dirty to get his way. Gammeron often acts without thinking, and shows little regard for any negative consequences of his actions. He tends to address humans with the term "Terrans." Quote: "Look, I know we planned the trip to your mother's. Yes, baby, yes. Yes, I understand. I am working, understand? Work. Pays the bills on that rotating phase modulation unit you needed so badly. No, I don't mean to be snide. Look baby..."
I've never read an issue of JLTF, but if it has characters like this, maybe I should. Love this man! When did he meet Steel? Tom, JLTF was hit and miss during the year and a half it was an anthology series with rotating membership and creative teams. After the "Judgement Day" crossover, the team line-up solidified and Mark Waid passed the writing chores to Christopher Priest. The team was pretty lame and anti-commercial, so Priest did his best to make up for it with lots of sarcastic dialogue, layered humor, and hard left turns in the plot. It was kind of a mess, as plot threads from The Ray weaved in and out, subplots were dropped without resolution, arcs were extended and mauled by editorial drama-- but it was a ballsy gas of a book. M.C., Gammeron's best (and least respectable) appearance was in Steel #51. The book was canceled already, so Priest really took the piss on this penultimate issue. Will, I can guarantee you that there is not a single soul at DC right now who cares enough about Glenn to even kill him off in a crossover, much less use him properly. No one could be bothered with the JLTF either, but it would be easy enough to just refer to them as the "Task Force" sans "Justice League" with nary a retcon.